As a body scrub – Add a spoonful of crushed up epsom salts to a dollop of body wash then later up and rinse. To get beachy waves – Mix a teaspoon of salts, a few drops of olive oil and a 1/4 cup of water into a spritzer bottle. Mist on damp hair, you can also scrunch your hair to create a greater effect. 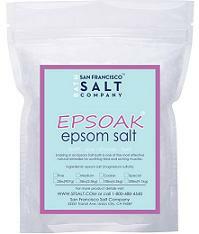 Foot soak – Add half a cup to your pre-pedi soak and it will help soften skin and calluses and dry out blisters. It can also help relieve itchiness and reduce foot odor. As a hair volumizer – Add equal parts of epsom salts to your conditioner and leave on your roots for 20 minutes. Try not to use it on all your hair as it roughs up the hair cuticle and may make your hair look dull. As a hair clarifier – Mix together 1 cup of epsom salts, 1 cup of lemon juice and a gallon of water. Let it sit overnight and then pour over your hair before you shampoo. To fade bruises – Toss 2 cups into a bath and then soak. The salts’ minerals help fade dark marks. As bath salts – Mix 2 cups of Epsom salt with a few drops of fragrance and food coloring or ½ teaspoon of glycerin. Store in an air-tight container. Thank you for the tips! I never knew how versitle epsom salts were.